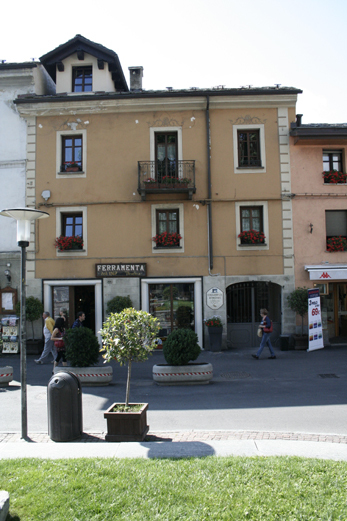 Chambre of Hotes 'La Méizòn de Sara' is situated in the historical center of Aosta, to the beginning of Street Sant'Anselmo to the n° 134, from which part and it develops him since his birth the millennial Fair of Sant Orso that animate and it revives the city every year 30 and 31 January. The structure and to alone 20 meters to the 'Arco d' Augusto’ in a comfortable and fabulous enviable position, thanks to the panorama of which they enjoy and they offer all of his rooms, it won't seem you to be in a city center! To two footsteps will find the ancient Collegiate of Sant'Orso with her precious cloister and the innumerable Roman vestigias of which Aosta is rich what, The amphitheater, Porte Pretoriane and… some footstep anchors can visit all the other remainders and not less important archaeological beauties of the city (Augusta Praetoria)! To 700/800 meters the telecabina for Pila village, to 500/600 meters the railway station and that of the buses, In strategic and central position to visit all the beauties of Aosta Valley.